For latest Cupertino trends, please go to this page. Cupertino's real estate market is showing a tremendous trend in both Sale Price To List Price Ratio and Average Days On Market number as seen in the chart above for Single-Family Residences and Townhomes+Condos. From an average high of 85 Days On Market in February 2012, the number has come down to just 15 days in May 2012 and just 19 days in June 2012. 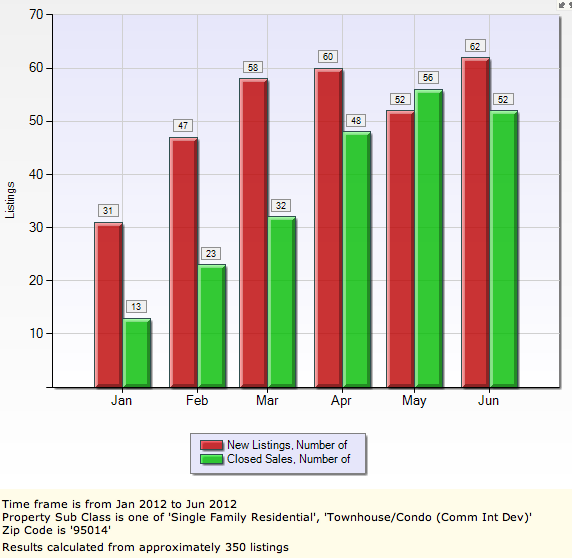 The Average Sale Price was approximately 96% of the Average List Price in January 2012. 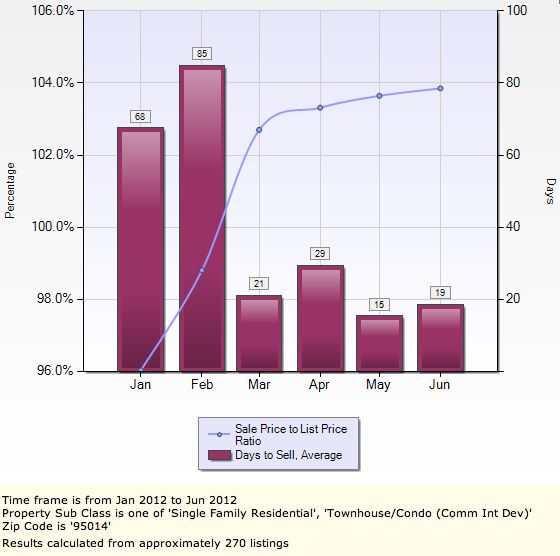 That ratio has moved up to 103.8% of List Price as of May 2012 and 103.9% in June 2012. This represents a high demand recovery trend in that there is very good demand for houses with many buyers out in the market, and this is combined with very low inventory of houses on sale. 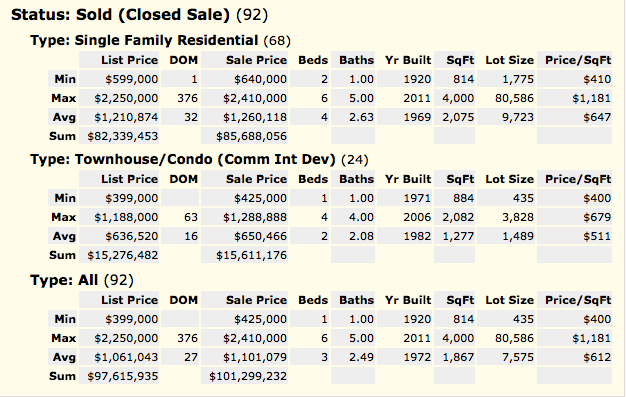 Another statistic of interest is the Homes Sold trend in Cupertino versus the New Homes on Sale trend. As you see in the chart below, while May 2012 was a month where Homes Sold number at 56 went beyond the number of New Listings in Cupertino at 52, the month of June 2012 has somewhat compensated with inventory levels going back a bit to 62 but still higher than April and prior months. Most homes sold very quickly in the past two months. Here are some interesting statistics on the recent sales in last 90 days for a quick look in terms of Single Family Homes and Townhomes+Condominiums. With an average of slightly over 1 home per day, the Cupertino real estate market has been really popular with buyers. As the economy improves, and more companies hire around Silicon Valley, the real estate market here, and overall in Silicon Valley, is expected to continue this momentum over the summer of 2012. A high demand market is a very good time to sell. As the stats above show, the Cupertino area demand for housing is very high, and selling your home during a high demand period should yield you very good offers. Real Estate investors typically invest during turnarounds as they see it as once-in-a-lifetime opportunity especially given the housing collapse of the last few years. Remember you are not just buying a house but also investing in a neighborhood. The better the neighborhood, the better your long term resale value. And better neighborhoods always have a premium associated with them due to constant demand such as in Cupertino. If you find a home that is the best among the houses you have seen, within your budget and wont break your bank, in a great neighborhood, and meets most if not all your real estate buying goals, go for an offer, as such an opportunity may not present itself back again for a while. Its a decision you have to make going between waiting it out to exercising the option to put in an offer and see if it will make it. While it is also possible that markets could cool off a bit with more supply the probability appears to be low, given that this is a turnaround situation with improving economy, growth of new and old tech giants and population growth. A hot market like Cupertino will take a while to cool off if at all - barring insane growth in home prices making it unaffordable to the majority, in which case, there is sure to be a cool off in demand. At an average of 103.9% of List price in June, this premium is well within limits although there may be some outliers in that some houses may have gone for more than that. In multiple offer situations, many times more than the offer, its the quality of the offer that matters to sellers. So making a reasonable offer is a good idea. So keep a watch on the trends and speak with me as often as you can to help you get to your goal of owning your home. This is great information on your blog. I was looking for exactly this type of information on Cupertino housing situation. Thank you very much. Thank you, Jasleen. Its great to have your feedback. I have sent you an updated list of homes to look at. Let me know if you'd like to visit any of them. Excellent analysis - very insightful data on the Cupertino housing market. I am looking to have an update of the July statistics to see how the housing demand is at - we are looking to buy and would like your help with this. Will contact you off line. Thank you very much Ramesh. It was great to chat with you about your needs. Looking forward to helping you buy your home. Don't hesitate to ask me any questions you need answers for.